Designs for the new affordable homes proposed in Llanbedr Dyffyn Clwyd near Ruthin. A development of 38 new affordable homes for local people is planned for Llanbedr Dyffryn Clwyd, near Ruthin, in Denbighshire. 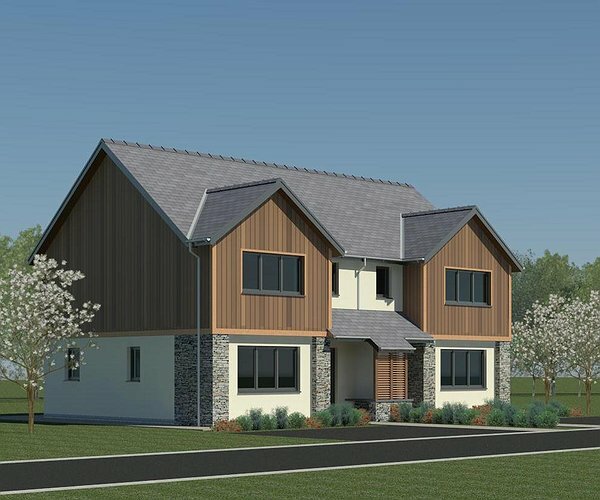 The proposed scheme will include a mixture of two and three-bedroom high quality family houses and bungalows on land near Maes Derwen in the village. The homes are being developed by the Pennaf Housing Group in partnership with local builders Williams Homes of Bala, Denbighshire County Council and the Welsh Government. The Welsh Government is to provide £5.1 million of funding from their Innovative Housing Programme (IHP) towards the cost of 36 homes originally planned for the development and an application has also been made for £185,000 of Welsh Government Social Housing Grant support for a further two homes that have been added into the scheme..
“We are currently at the pre-planning community consultation scheme before formally submitting our plans to the to the local authority, so that we can ensure any local feedback is fully considered,” said Craig Sparrow, Executive Director of Development for Pennaf. Mr Sparrow added that the new homes would be managed by Clwyd Alyn Housing Association, which is part of the Pennaf Group and, subject to planning consent, they hoped to start work on site early in the New Year. A local lettings policy will be in place for the scheme.